The ultimate source of FreeSpace info. There are 2,632 articles and 5,041 registered users. Alternately, explore the FreeSpace universe through categories. 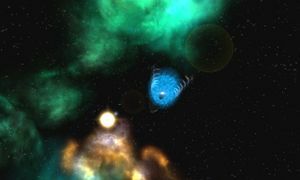 The FreeSpace Wiki is designed to be a comprehensive source of data for the FreeSpace series of games, including information about the games themselves, the FreeSpace universe, and community activities such as modding and the Source Code Project. It also contains help with some of the more common problems, such as setting up multiplayer and obtaining the FreeSpace games, which can be quite difficult in stores. 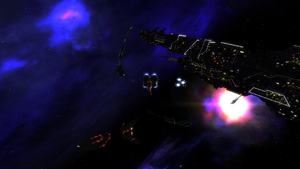 Anyone can edit the FreeSpace Wiki, and we encourage you to do so, but please read our Canon Policy for information on what sort of data should be submitted, and how to submit it, before you begin. You should also note that registration is required to edit the FreeSpace Wiki. If you want to contribute but can not decide where to begin then you could start with going through the requested pages. Another place you may want to look at is the Special pages listing. Lastly, if you want to add a Veteran Comment, please read our Veteran Comments policy. The Hammer of Light-controlled Altair Shipyards in STL: Origins. Shrouding the Light cemented Blaise Russel's reputation as a master of FreeSpace campaign design. Unusual in that it is both a Great War-era campaign and a Vasudan campaign, it combined a fresh look at existing FreeSpace history with imaginative and well-designed missions. 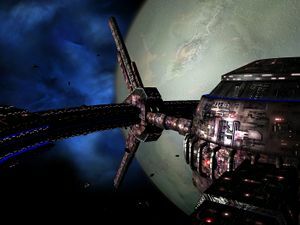 It subsequently received an "expansion pack" in Shrouding the Light: Origins, a series of campaign vignettes serving as a loose prequel. This page was last edited on 11 April 2013, at 10:09.